Home / kentucky / niecelove / PopWorks! 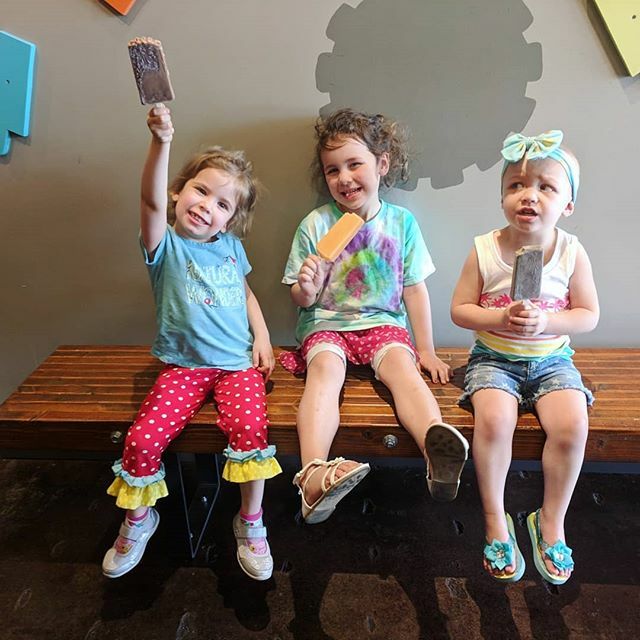 PopWorks is our favorite places to take the girls for a sweet summer treat. Who am I kidding!? We went during winter, too. They are a small artisan popsicle shop located on Scottsville Rd in the shopping center behind Steak & Shake. They are handcrafted using local produce, local products, and all natural ingredients. As you can see in the picture above, they are also a good size serving and I have never ordered two because the first one wasn't satisfying enough. They have flavors that you just don't find on a menu in a drive-thru. Lavender lemonade, chai, blueberry lemon, cantaloupe, and chocolate avocado have all been tested & approved by our family. The coconut cream, if you are even marginally fond of coconut, cannot be missed. It is heaven on a stick! It would be easier if they had a drive-thru like so many fast food choices do, but it is worth it to me to go in knowing I am getting Kindred a healthier treat. And, by "Kindred" I mean "me and Kindred"...also, sometimes just me. You can also find them at the Farmer's Market on Saturdays and downtown at Spencer's Coffee. If you go, be sure to let me know what you try!